An Objectivist Individualist: Obama Wants Bigger Government on Top of This? Obama Wants Bigger Government on Top of This? Of course there is no limit to the extraction of money, time, and other resources from the private sector for the use of the government sector in this fool's mind. 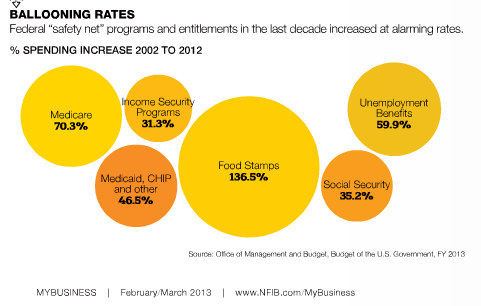 All of these programs have grown much faster than real, per capita income has in that time. This has been especially true during the four years Obama has occupied the White House. This is a huge problem he simply does not recognize, which means he is either incredibly dumb or incredibly evil. Is the Earth Still Warming?